At the end of July 2017 a new type of transportation was announced for Disney World: Minnie Vans. These adorably named and decorated Minnie Vans are a pay service available to transport Disney World resort guests around the immense Disney World property instead of the usual free buses, monorails or boats. 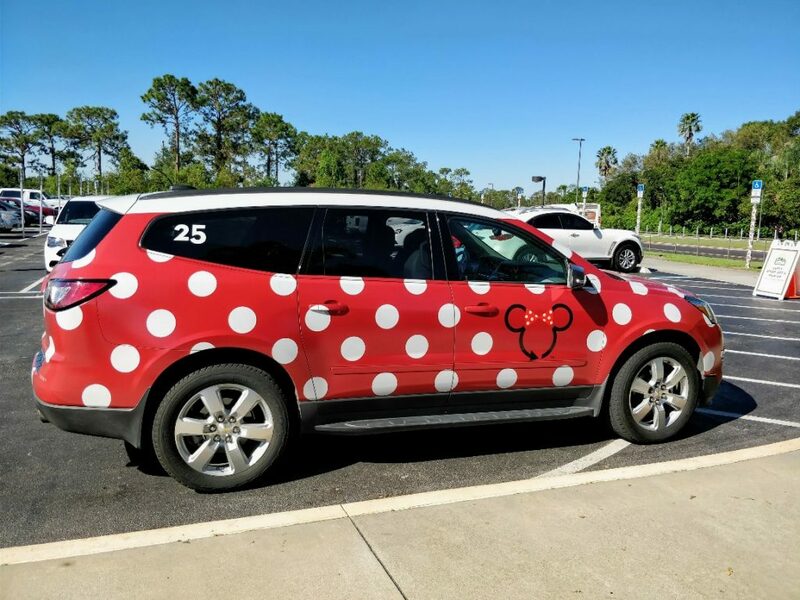 This Minnie Van review will give you all the information, information on how to request a ride, and when I think it is worth it to pay for a ride at Disney World. Minnie Vans aren’t actually vans at all, but red and white polka dot Chevy Traverse or Chevy Suburbans. These vehicles are driven by Disney World cast members who bring the expected Disney service to your ride. Although the Minnie Van fleet has expanded since the service started there are still not enough vehicles to meet the high demand. During morning and evening hours almost all of these vehicles are in use, but you should still expect longer waits because this service is extremely popular. Who Can Use The Minnie Van Service? 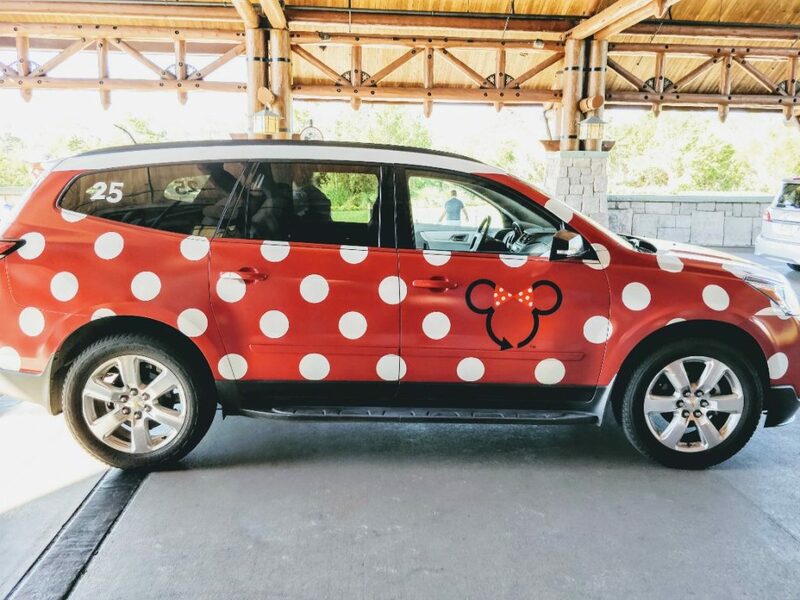 It used to be that only guests of certain Disney World resorts could access Minnie Vans, but now the service is open to everyone. How Many People Can A Minnie Van Accommodate? Minnie Vans can provide a ride for 6 passengers. Two car seats are available in each Minnie Van. The car seats are installed at the time of pick up. The cast member has been trained to install the car seats which can be rear, front, or booster style depending on the age and size of the child. Confirmation the child is properly restrained is required prior to leaving. Minnie Van prices are now based on time and distance driven similar to other Lyft rides. Minnie Vans are a premium service and are priced to reflect that. For example, a Minnie Van home from Hollywood Studios to Caribbean Beach Resort cost us $33 whereas a basic Lyft ride would have been considerably less expensive. What About Those Who Have Wheelchairs Or Service Animals? There are currently 2 wheelchair accessible Minnie Vans at Disney World. There is no way to specifically request one. You request a regular ride and when the cast member arrives you can ask them for a wheelchair accessible vehicle. They will then contact the dispatcher and request the special vehicle. All Minnie Vans are equipped with pet blankets for those with service animals. 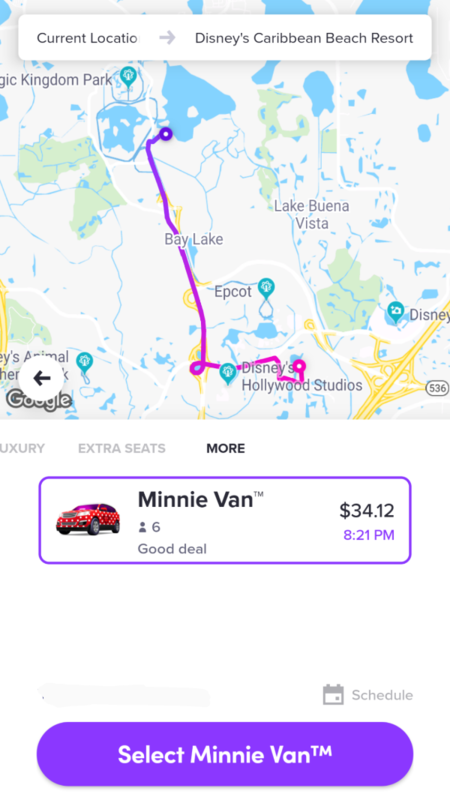 Anyone with the Lyft app can use Minnie Vans within Disney World. Download the Lyft app and sign up for an account if you don’t already have one. When looking for available rides swipe left until the “More” heading appears. This is where you can reserve a Minnie Van. I requested a Minnie Van ride one morning from our home resort of Copper Creek Villas at Disney’s Wilderness Lodge. I had walked to the bus stop and found that we had just missed a bus for Animal Kingdom. Expected arrival time for the next bus was 25 minutes according to the board. I figured this was a perfect opportunity to try a Minnie Van. I used the Lyft app to request the ride. We waited about 10 minutes for our pick up at Wilderness Lodge. Our ride from the resort to Animal Kingdom took about 18 minutes. The drop off area for Animal Kingdom is in a parking lot at the end of the usual Disney bus area by bus stop 17. This drop off spot was a long walk to the entrance of Animal Kingdom, but we still ended up making it into the park at least 20-40 minutes earlier than we would have if taking the complimentary bus system. We’ve used Minnie Vans on other occasions, too. After a long day at Epcot and then Disney After Hours at Hollywood Studios we were lucky enough to snag a Minnie Van home. It was a great treat to get back to our room at Caribbean Beach Resort quickly and comfortably in one of the newer Chevy Suburban Minnie Vans. This Minnie Van even had mobile phone chargers that work for iPhone, micro-USB, and USB-C phones. 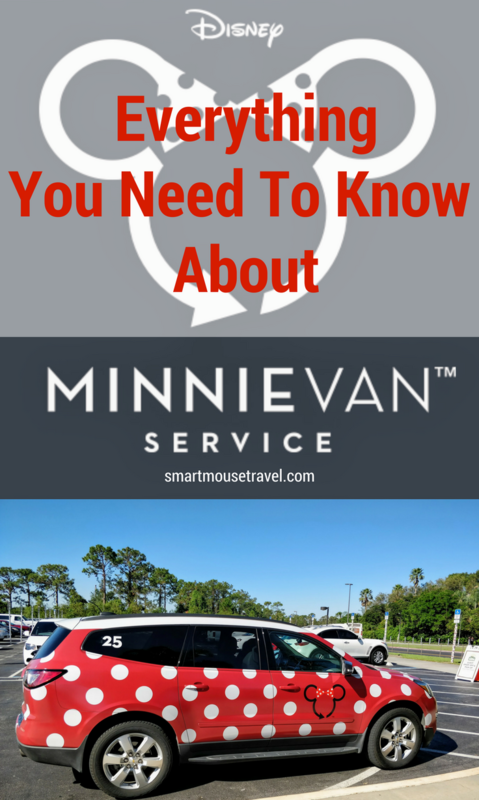 Minnie Van service can not drop off directly in front of the theme parks, but will generally get you close to the edge of the transportation depots. Once you have the Lyft app you may request Minnie Van rides throughout the Disney World property. Expect wait times to be longer in the morning when people are heading to the parks for breakfast reservations and at night around park closing or dinner time. It is not unusual to be unable to hail a Minnie Van at park close because the service is so popular. Wait times are generally lower in the middle of the day. Do not use Minnie Vans if you are switching resorts during your stay. The vehicles do not have the capacity to transport both people and luggage. Minnie Van service is available from 6:30 am to 12:30 am (hours subject to change). Minnie Vans are now also available for trips to and from Orlando International Airport for all Walt Disney World hotel guests. To book Minnie Van airport rides you need to call 407-WDW-PLAY. The Lyft app only works for booking Minnie Van rides while on Disney World property. The cost of a Minnie Van is $150 for one way transportation to or from the airport. A round trip from Orlando International Airport to your Disney World hotel and back runs $300. Flights must arrive between 7am and 10pm and depart between 9am and 12am. We had great experiences during our Minnie Van rides. They are a nice way to save some time and hassle that you often encounter with the free Disney Resort transportation. If money were no object I would absolutely use this service constantly, however that is just not realistic. I would recommend Minnie Van service if you are going from one resort to another resort for a dining reservation. This is a great use of the service since resort to resort transportation at Disney World is not easy. Minnie Vans are also a great option if you need to get to a park quickly and there is a wait for complimentary transportation (which happens often). I think Minnie Vans are also a great option for those who need to get the kids back for an afternoon nap and don’t want to miss a lot of park time. Have you taken a Minnie Van? Did you enjoy your experience as much as we did? wow this is an interesting concept. When we went to WDW we stayed at Port Orleans, which was awesome, but my husband HATED the bus rides and waits. Now why would you do Minnie Van over just calling Uber or Lyft. Would that be cheaper? I mean its not disney endorsed, but just curious! Good question! I think one main advantage of a Minnie Van is car seats are available for young children (which I find more difficult with Uber or Lyft) and staff are fully trained how to install them. 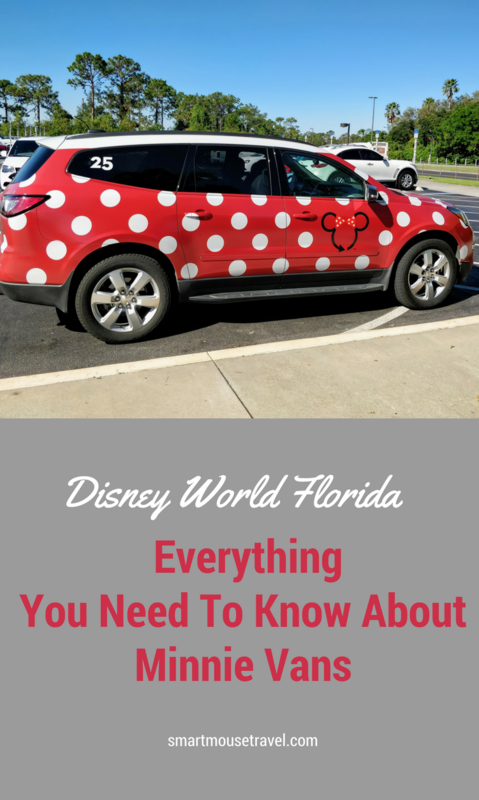 The drivers of Minnie Vans are Disney cast members so they are especially helpful with any Disney World questions you may have. And Minnie Vans are really cute…but that’s not exactly a reason. We were not able to use it in Nov due to the lack of availability. I think this will be a great service once they add more cars. I’m actually shocked Disney has rolled this out so slowly. It’s pretty frustrating. We waisted a lot of time waiting for a Minnie Van because the app isn’t very informative between the time you request and the time it assigns a driver. It never indicated a potential wait time. I even asked the front desk if this was correct. We finally caught a bus instead, but had missed a few in the process. That said, I can’t wait to be able to easily use it. I’m happy to pay the $20 fee each way to get direct car service with car seats with a cast member who knows exactly where to go.